Ivy Lawn staff recognizes the challenges of making final arrangements, including cremation or burials, and the purchasing of interment space. We assist you with care and compassion in making these decisions whether you are planning for the future or need to make immediate arrangements. Ivy Lawn Memorial Park has always been and will always be a sacred place of remembrance, a place to mourn those we have loved, a place to seek inspiration and solace, and a place to celebrate life. While a historic landmark, Ivy Lawn is still an active cemetery, providing services to people of all faiths. 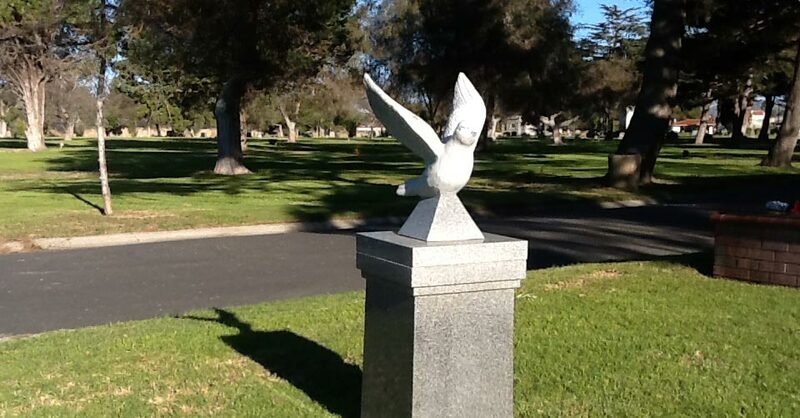 For more information on our cemetery services and associated costs, download our detailed brochure, call us (805-642-1055), or submit this form and a staff member will contact you. Learn more about our Direct Cremation Services. Who Authorizes a Burial? Click here for more information. Individuals can choose their funeral plan in advance. A popular way to ensure that end-of-life arrangements are taken care of is to purchase prepaid burial plans, also known as pre-need plans as you are paying for the services before they are needed. Most of these plans are established through funeral homes or cemeteries and involve outside companies holding money that is paid in trust or through an insurance policy. Prepaid funerals spare families from having to make difficult and costly decisions at the time of their loved one’s death. Read about Homesteaders Life Company insurance for prearranged funerals. An individual or family wanting to buy a prepaid burial plan meets with a funeral home or cemetery in advance to discuss arrangements, selecting the type of funeral desired and the services to be included for an agreed upon price. The individual or family then pays the contracted price before the individual has died. That pre-paid money may be held in a financial vehicle, such as a trust fund, life insurance policy, or annuity to be paid at the time of death to the funeral home and cemetery. Burial contracts can be revocable or irrevocable. Revocable means that you can change the terms of the contract or cancel the agreement, with potential contractual penalties attached. Irrevocable burial contracts are agreements that cannot be changed. Most states require those seeking Medicaid assistance for nursing home care to purchase irrevocable pre-need burial trusts. This ensures the state that the individual’s funds will be designated solely for burial needs and cannot otherwise be spent. The contract spells out the goods and services purchased. You can choose the location of the cemetery plot or mausoleum space, headstone style and wording, casket, grave liner or vault, urn, and the opening and closing of the grave. Funeral home services include the ceremony, private viewing room, space for family and friends, photos and video services, flowers, music, embalming services, and processional transportation to the grave site. When you die, these arrangements have already been paid for and the cemetery should provide the services as outlined. The funeral home is paid at that time from the trust or annuity. Prepaid funeral arrangements offer many advantages, and the primary one is peace of mind that you have made the arrangements in advance and will not burden children or loved ones with paying for or making decisions about these end-of-life matters. You also will have control over how your services and the burial will be performed to ensure that you are remembered as you wish. You can save money by purchasing the plans ahead of time; with most contracts you can lock in favorable prices that won’t change or increase. For any variable costs, you can include provisions in the contract for inflation by buying life insurance that increases in value over time. As with any business dealing, take care that you are entering into a contract with a reputable party. Do your research on the contract provider or insurance company to make sure they are reliable. Also confirm that each item selected for your burial service is listed in writing in the contract to ensure that you get the quality of goods and services for which you are paying. Determine where any interest on the investment money goes and ensure that you are given credit for all payments and charges made. Read the fine print of the contract carefully as some contracts may not allow for refunds if you cancel the plan. You also may not have transfer options if you decide to be buried somewhere else than where you originally chose. Pay particular attention to whether you are signing a revocable or irrevocable contract with a beneficiary other than yourself, because once you make it irrevocable you will not have the right to change it. Some insurance contracts have a provision that the insured has to outlast a waiting period, and if the insured dies too soon there may not be any benefits paid at death under the contract, requiring that family members pay out of pocket for the funeral. IVY LAWN MEMORIAL PARK & FUNERAL HOME. We specialize in direct cremations and direct burials. If you are planning on burial at Ivy Lawn then consider our funeral home. We make a complicated process simple, affordable yet dignified.